You may have heard.... we are having a grand opening on December 6th from 10am to 6pm, with sales, door prizes and demonstrations, yummy snacks, etc.... A big thank you to Marilyn who is the big wheel in the background getting it off the ground! It has been very exciting, more consignment coming in, which is great! A lady brought in her Louet wheel, single treadle and about 25 years old in good condition. So pretty! I need to remember to take pictures! 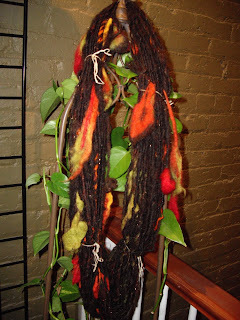 I did take a picture of my fall wool, here it is finished and blending in with some of our plants. I like how it turned out! Can't wait for the grand opening. I'll definitely be there! See you then!